So everyone who knows me knows, if there is one thing I love to bring to any shindig it’s my Oreo & Twix Cheesecakes. No, this recipe isn’t a dream, it really does exist, and during this exciting time in my life, launching this blog, I have decided to share it with you. –Get ready to make any event you attend that much better with these lavish little desserts (Also check out my “FEEDBACK FROM EXTRA SPARKLES PLEASE” at the bottom of this post to be pre warned of anything you might run into). 2.) 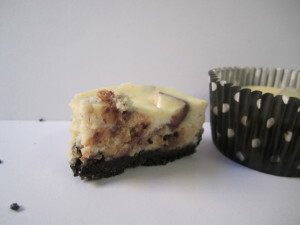 Take about 1-1 ½ tbsp of your cookie crumb crust mix and press it firmly with your fingers at the bottom of the cupcake liners (I hope I don’t have to tell anyone that they should wash their hands) Set aside and get ready to make the filling- AHHHHH! 3.) 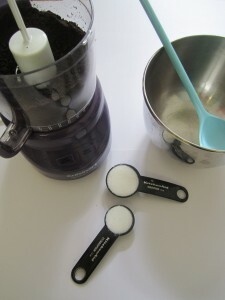 Time to get your mixer out and mix the cream cheese for 1 minute (no more, no less- this makes a difference) at a medium speed. Then, add sugar and vanilla extract. Add in eggs, one at a time, and once both beaten completely add in your sour cream. 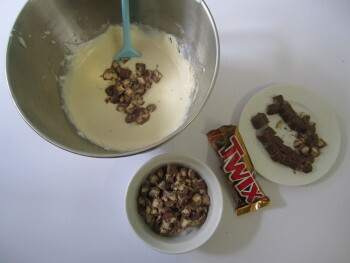 Last but not least, slowly fold in chopped Twix piecesand mix thoroughly. 4.) You are almost at the finish line; toss those babies in the oven for about 30-35 minutes. 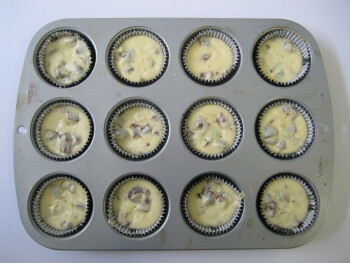 Now, this is the hard part, once cooled for about 10 minutes place in the refrigerator over night and the next day they are ready to be eaten…. and they will be. 1.) 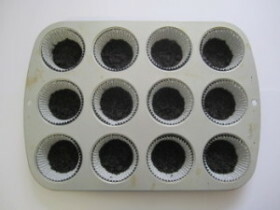 USE darker coloured cupcake liners, when you take them out of the oven you may notice some butter at the bottom. Don’t panic its normal, totally fine, just the butter settling with the crumbs. Once in the fridge it will be like this never happened. 2.) Do not make these if you can’t leave them in the fridge for 6 hours or more—I tried it and learn from my mistake you don’t want cheese cake soup (or do you?). 3.) When I say 30-35 minutes I mean it, they might look a bit under cooked but, they are NOT, so take them out I tell you! 4.) If you have a bit of left over crust or filling, its normal and happens. You can eat it! 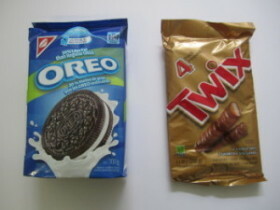 Can’t wait to try these, they look delicious! Perfect for a girls night! hi i made these today and they sank in the middle, how can i prevent this? This could be a couple of things and totally happened to me as well… sometimes they still slightly sink but I hope everyone loved them. a.) 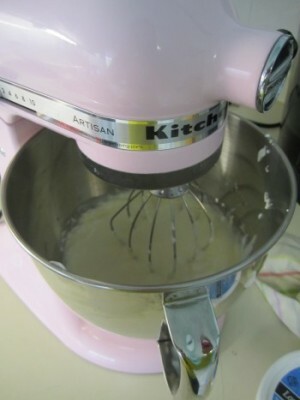 you may have over mixed your batter and by doing this it allows air bubbles to enter. you want the batter smooth not watery. c.) Eggs make sure you are adding the eggs in 1 at a time!! Sounds minimal but totally makes a difference! If you are worried cut the eggs from 2 to 1 1/2! hi! i tried them again and they keep sinking, they are delicious but im selling them in my neighborhood so i want them to look spectacular too! That is just so odd. I have been making them for years, along with my friends and they always sink slightly but not as much as it seems! If you get a chance message me on my contact me section on the blog and I will email you back so you can send me a photo! Try to check it out from there! My last solution is don’t fill them up as high! Hang in there!